This sock was originally meant to go with my Santa’s Washing pattern but I decided it was too big for the other pieces. That meant I had to start over but didn’t want to let such a cute sock go to waste. 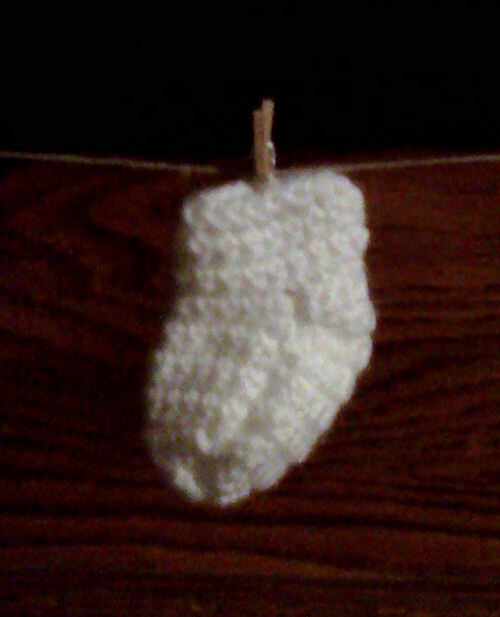 I wanted to make sure the sock could be made using any weight yarn, which meant no working in the round. I found cerdeb’s Turkish Socks pattern on Ravelry and modified it to make a tiny sock (with permission of course). So, if you find this method of making a sock interesting, why not try out the full sized version for yourself? Insert hk into first st, yo and pull through, insert hk into next st, yo and pull through, yo and pull through all lps on hk. Ch 2, insert hk into second ch from hk, yo, pull through, yo, pull through 1 lp on hk (base ch made), yo,pull through both lps on hook (sc made). *Insert hk into base ch, yo, pull through, yo, pull through 1 lp on hk (base ch made), yo, pull through both lps on hook. * Rep from * to * across as many times as needed to get the required beg row. Row 1 With white, fsc 18 leaving a long tail for seaming. Row 2 Ch 1, turn, sc in ea fsc across. Row 3 Rep row 2, pm to indicate RS. Rows 4-5 Rep row 2. Fasten off. Rows 21-26 Rep row 20. Rep Toe section. Fasten off leaving a very long tail for seaming. The tail will need to be long enough to seam up both heel sides, both foot and toe sides, and across the back of the heel/cuff. Fold cuff around so side edges meet, RS together, and seam short edge together with whipstitch. Fold heel over itself, RS together, and seam angled sides together on side where long tail is. Run tail under a few sts to other side of heel and seam angled sides together. Fold foot over at toe, RS together, and continue seaming up the side of the foot and toe, run yarn under a few sts to other side of toe and seam up the toe side and continue up the foot. When you get to this part, you’ll notice that the top of the heel now meets the back of the cuff. Continue seaming and sew the heel and cuff together. Fasten off. Weave in ends and turn sock right side out.